Wow, this is a busy book with so much happening that at times I must confess I wasn’t really sure what was happening. The action is certainly fast-paced with the ultimate goal of the protagonist and friends saving the planet from Weapons of Gas Destruction (there is a major farting antagonist, The Blank Space). The book abounds with slapstick humour and features some wacky secondary character such as Major Pain, Dr Disastrous and Agent Pounds. 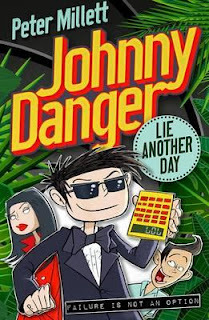 Jonathan Dangerfield, boy wonder, aka Johnny Danger, is joined by his spy team, Tim Lee and Penelope Pounds as they head off to a remote Amazonian jungle village to confront old foes. Using crazy gadgets and with numerous references to computers and social media, they also employ bungee bogies in their quest. This a book for readers (probably boys) aged 9+ years who enjoy adventure and lots of nonsense with battles between secret spies, eccentric and mad villains, and double agents. Oh, and there is also an annoying brother, school scenes and numerous codes to be broken. There is plenty here to engage readers.